Does Sentinel actually kill fleas or does it just stop their ability to reproduce? It stop the fleas from breeding and/or kill flea eggs and larvae in the environment. What is the difference between Sentinel and Sentinel Spectrum? How come you don't require a vet prescription? They are the exact same product. 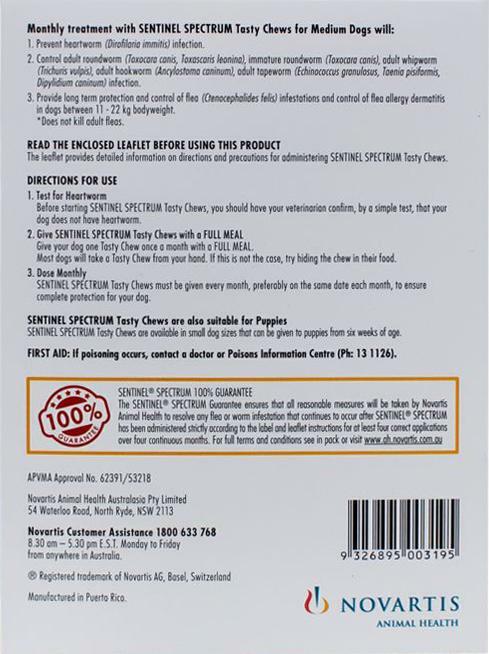 A vet prescription is only required if you are ordering from a country that requires it. We ship from Singapore which doesn't need one. The products are still genuine though as they are wholesale purchased from the manufacturer in the related country. What is the difference between this sentinel and the sentinel flavor chews? Sentinel Flavors are now discontinued and the Sentinel Spectrum is the new brand/packaging for the product.